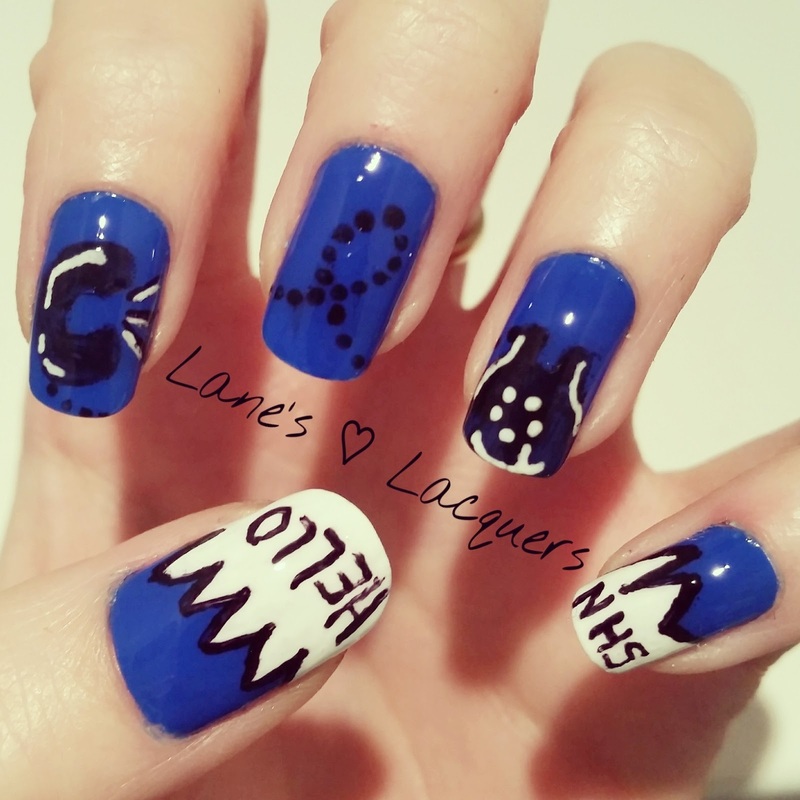 As promised on Thursday, I have pulled some classic cartoon/comic nail art out today for the '40 Great Nail Art Ideas' challenge. This ol' goody has been on my to-do list for the best part of two years hahaha, I don't think I'll ever have enough days in my life to do every design I would like to try on my nails. 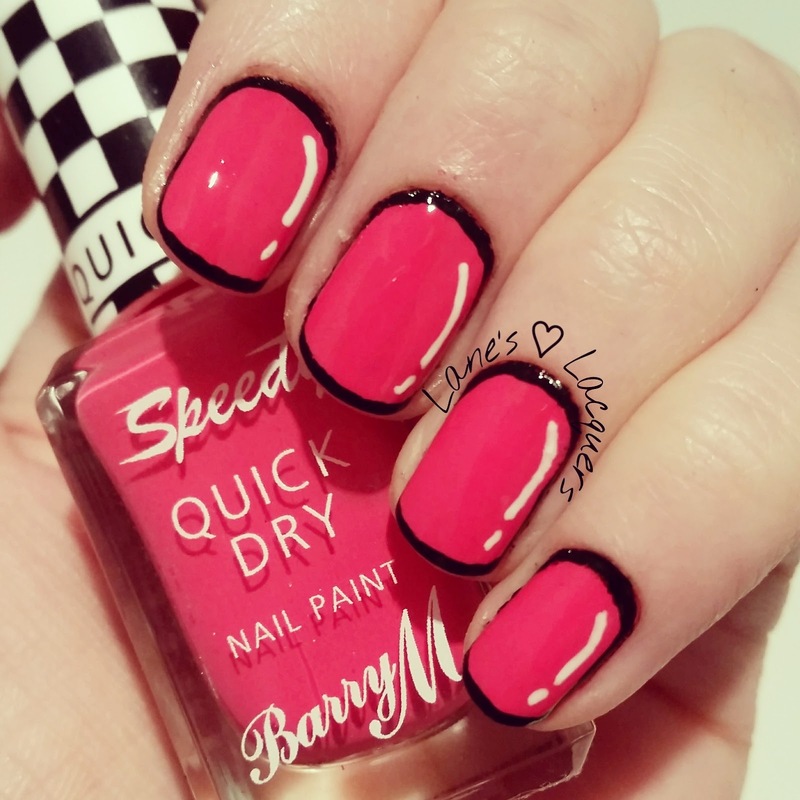 I chose to go with all Barry M for this one starting with two coats of Get Set Go from the Speedy collection for the base. Once that was well dried I used the Bazza Black & White Nail Art Pens to draw the frame and highlights and finished with coat of 3in1. This look is so fun I'm loving it. I've sort of put it off for so long because I've dreaded doing the frames, if you get messy with the black clean up can be a mare to say the least. But doing it with the nail art pen worked a treat and any excess on the skin simply peeled away once dry. Better result than I expected, you beaut Barry! Things have been a little slow here on the blog this week as they have at home. I've been feeling totally out of control of my own body with these SVT episodes and have spent as much time as possible (which is a lot folks) sleeping. Today was the first time I ventured out of the house in a few days because I literally HAD to start my Christmas shopping before it's too late to get things posted. I only managed a measly two hours before I was knackered but I thoroughly enjoyed the cold afternoon, early dark, twinkly lights and even a tiny glass of Bucks Fizz in Boots! 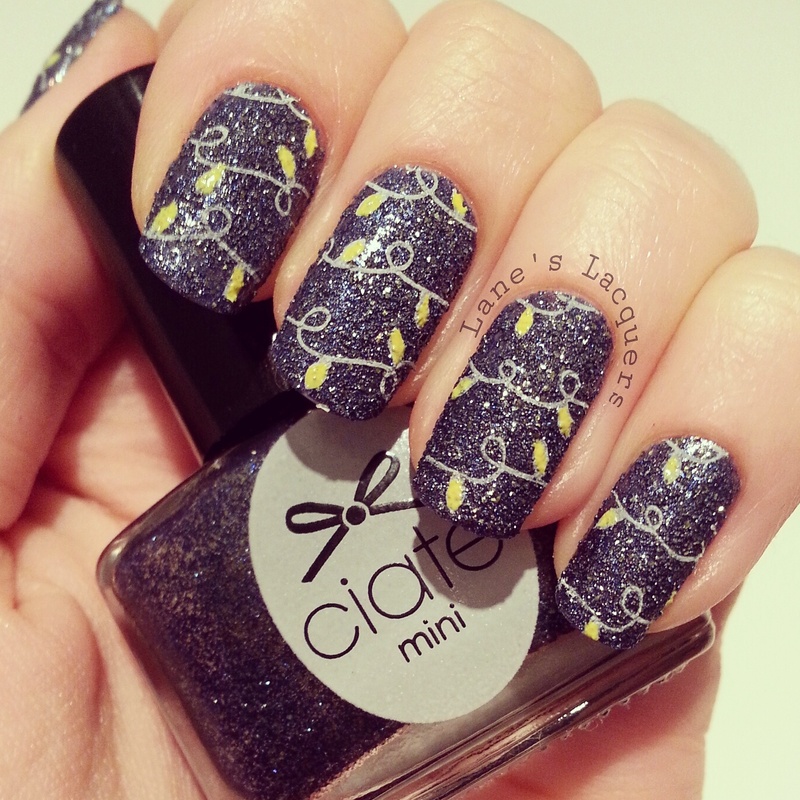 I think these nails featuring the lovely Ciate Mineral Clarity from last years advent calendar are a perfect throwback for today, simply perfect! You can see more details in the original post HERE. 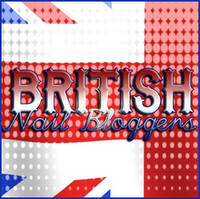 I'll be sharing my '40 Great Nail Art Ideas' mani on Saturday because I just haven't been up to painting them so far, between tomorrow evening and Saturday morning I hope I'll be able to pull something together! Unfortunately I didn't get to return to work yesterday, instead I spent 10 hours in A&E. Looks like my heart op wasn't so successful after all and my body is just super tired out! 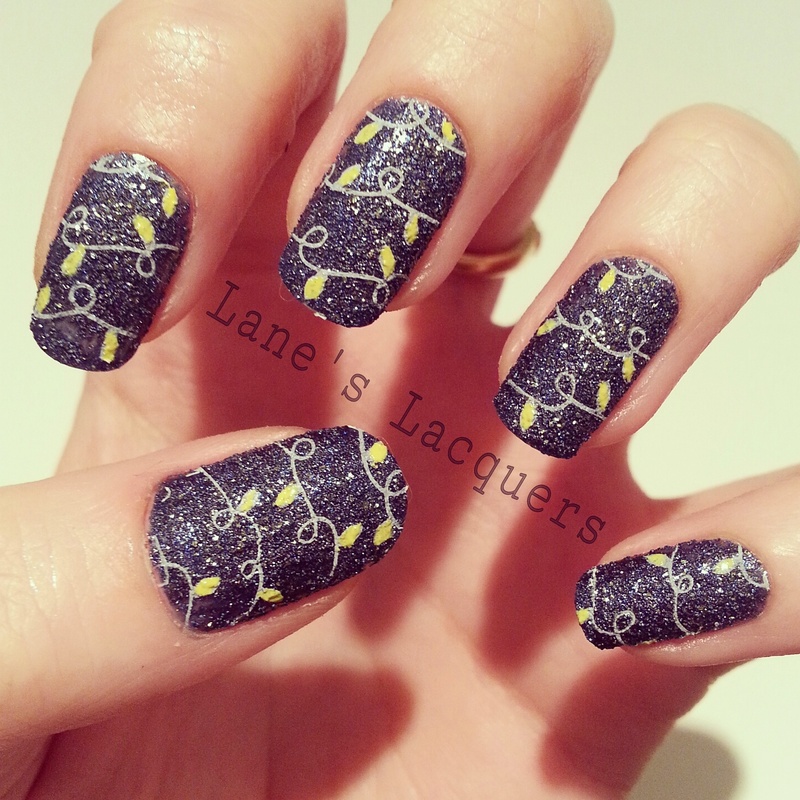 Luckily I already had this mani done and post scheduled... 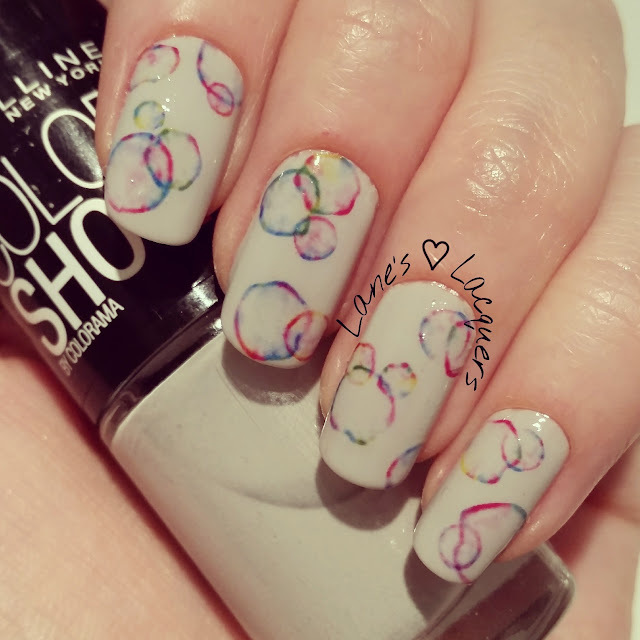 This weeks prompt in the '40 Great Nail Art Ideas' challenge is 'Grey & Colour' which is like music to my ears being the total grey-phile I am and my personal pattern is 'Circles'. I knew exactly what I was going to do with this because I had literally just received some nail mail which included coloured bubbles water transfers! 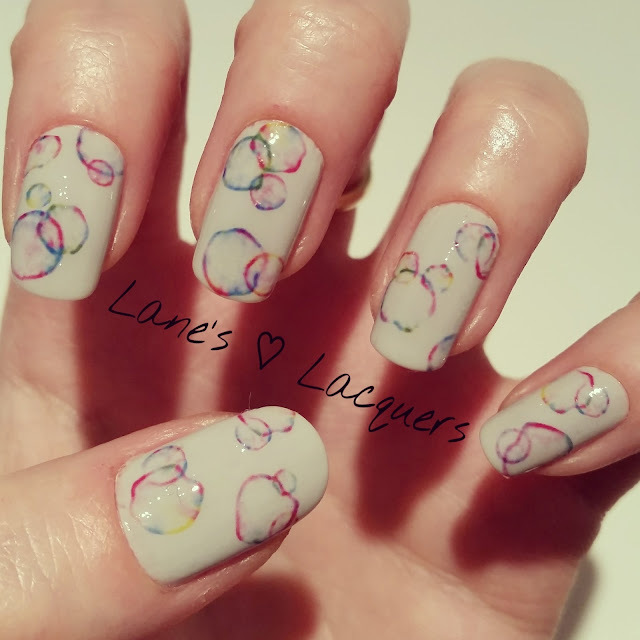 I used two coats of Maybelline Colorshow Cool Touch for the base and then used these cute coloured bubble water transfers from Born Pretty Store to add my required colour and circles! Finished with a lick of Barry M 3in1 Topcoat. 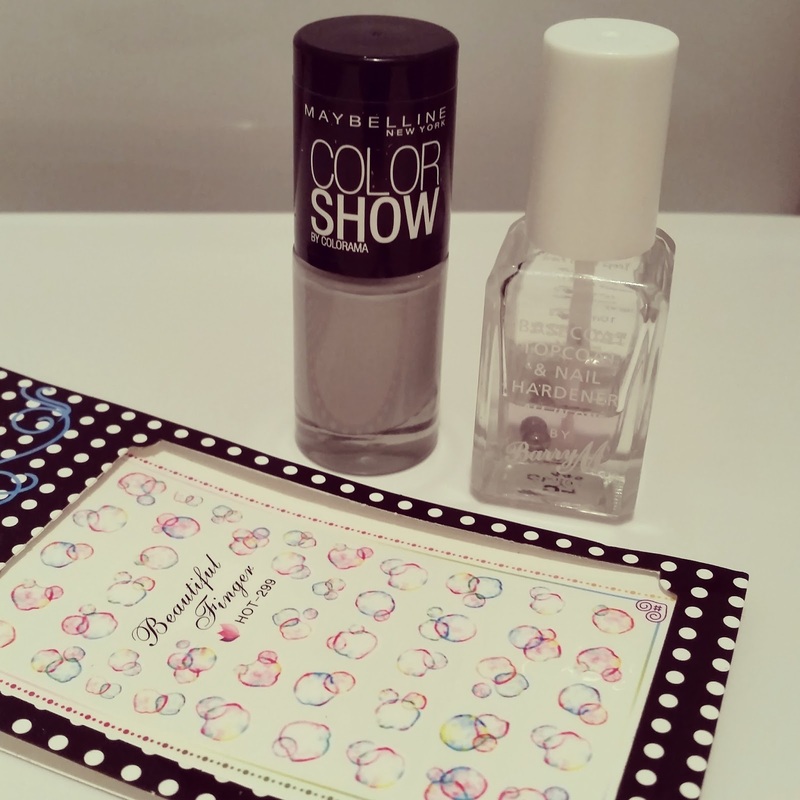 I love this Colorshow shade it's one of my favourite greys in my collection. I'm pleased with these transfers too, I got several different colour sets so I'm looking forward to thinking up some other designs to incorporate them into. 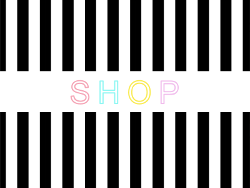 If you want to make a purchase from Born Pretty Store you can use my code: R2X31 for 10% off and remember to take a look at the other ladies grey & colour work below while I go take a much needed nap. Hello, hello and happy Friday peeps! 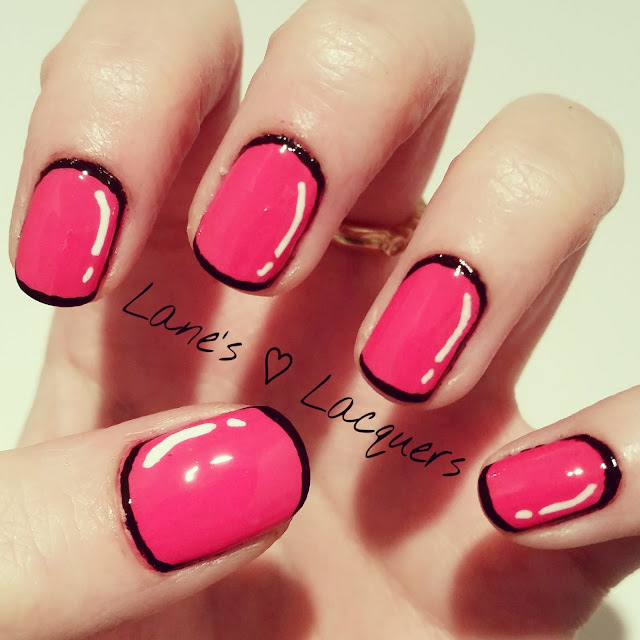 This week's '40 Great Nail Art Ideas' theme is a good one because it's a little challenging and also allows everyone to get to know each other a little better which is awesome! My job is in Reception & Facilities for an NHS Clinical Commissioning Group so A LOT of my time is spent on the telephone organising things, ordering things and helping people out. It's a very busy, random role with lots of good colleagues and I love it, I can't wait to return later next week after my post-op recovery is complete! For this mani I finally cracked open one of the numerous Wynie polishes I picked up for a bargain €1 while on holiday in Spain this summer. 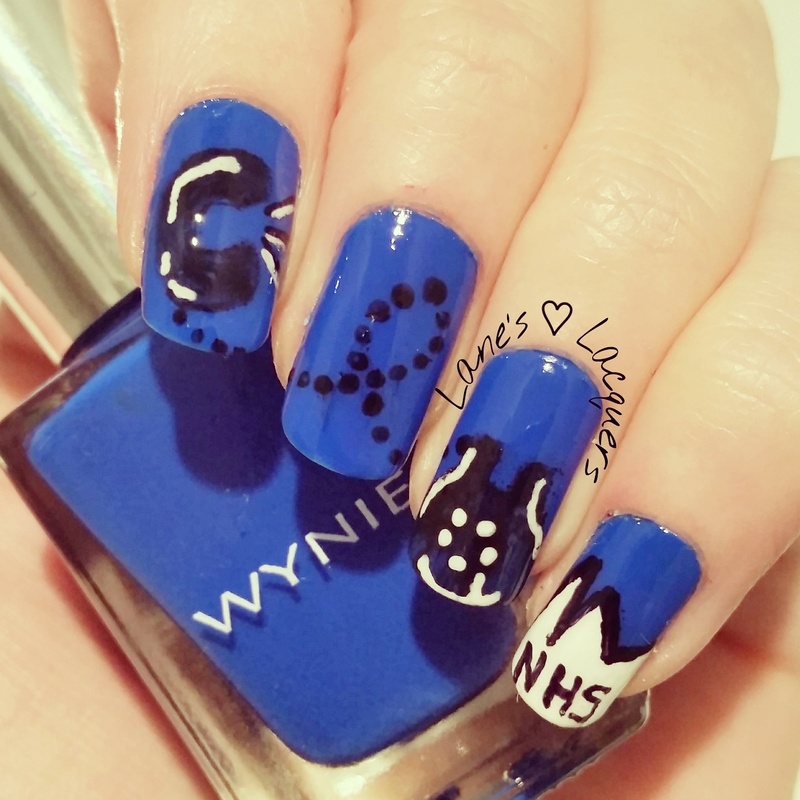 No.806 is a gorgeous shade and pretty close to that 'NHS blue' we all know. 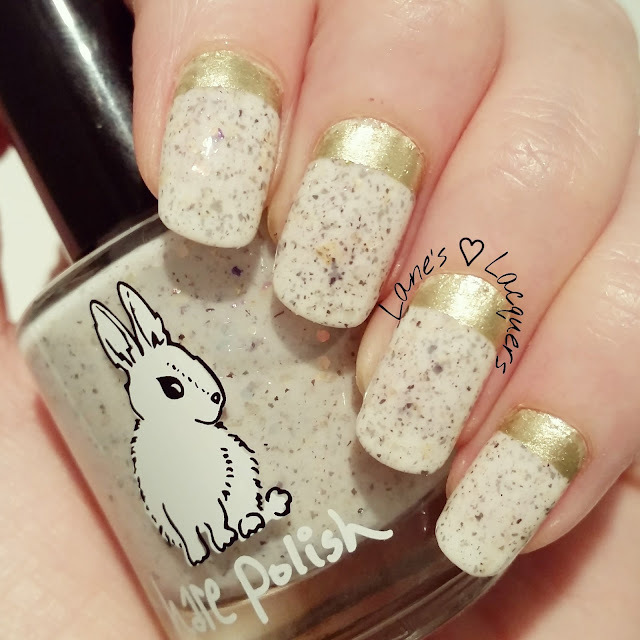 I used three thin coats for the base and was very happy with the formula. For the telephone/bubble art I used a small nail art brush & dotting tool with Barry M Black & White polishes. I added the white highlights with a nail art pen and the black outlines and words with a Sharpie before finishing with topcoat. I'm pretty pleased with how this slightly off-the-cuff mani went, it was a bit last minute because I felt kinda rough yesterday. 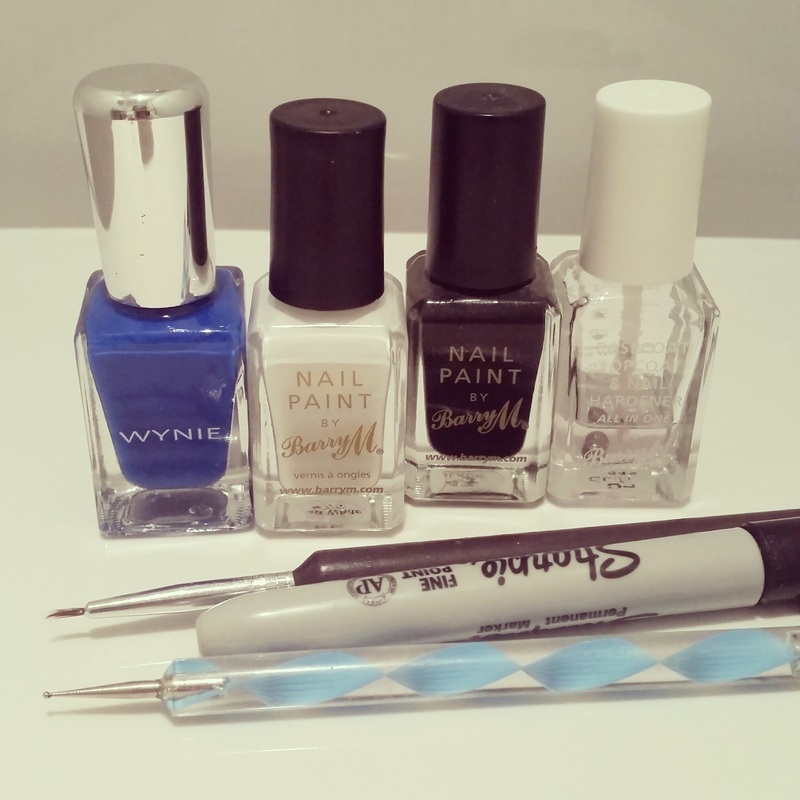 I was really pleased with the Wynie polish so I am just dying to try the others now, look out for them in posts coming soon! This is two thin coats of WTMCSM over Barry M Coconut undies. 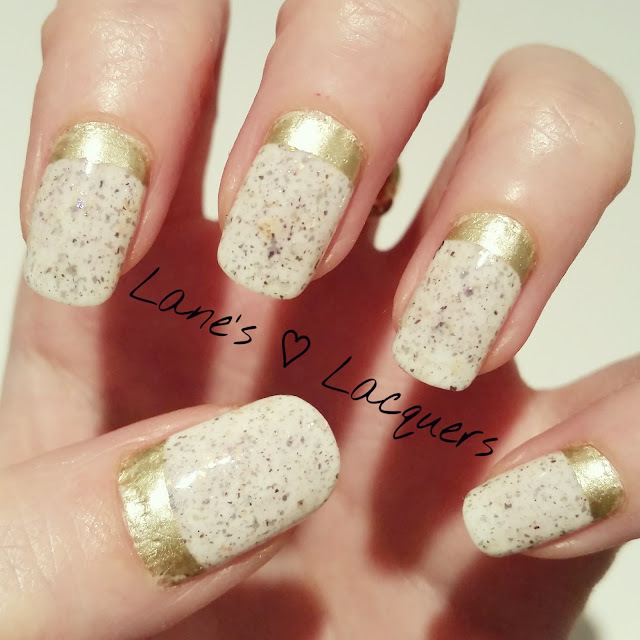 Once dry I used some half moon vinyls from She Sells Sea Shells, painting in the gaps with Gold Foil Effect to create this 'ruffian' nail art and finished with topcoat. The lighting just wasn't quite right tonight and I couldn't capture the true beauty of all the colours shimmering from the white... This makes me a little sad lol. I'm going to have to make some new adjustments for these dark winter nights. To help you visualise imagine the most delicate magical dragon's egg hehehe. 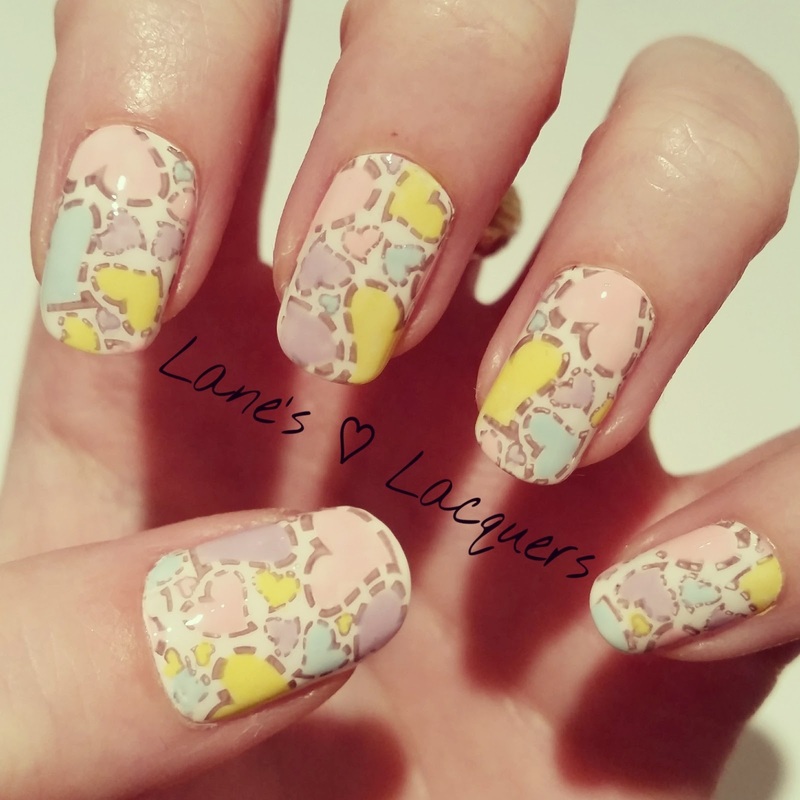 See you with the next installment of the '40 Great Nail Art Ideas' challenge tomorrow. Don't worry I didn't lose a day somewhere I do know it's Wednesday but I've done a bit of a swapsie this week and I think it's deserved. My Humpday Hare is moving to tomorrow to make way for a special #TBT today. I did this mani for Remembrance Sunday last year and I wanted to bring it back this year to mark today, Armistice Day (or Veterans Day for those of you in the USA). I really loved this mani and it's because I love the sentiment of today too. It's important that no matter your views on the government, military or wars you honour all those that have fallen for you, for if they had not volunteered you may have been forced to be in their shoes. 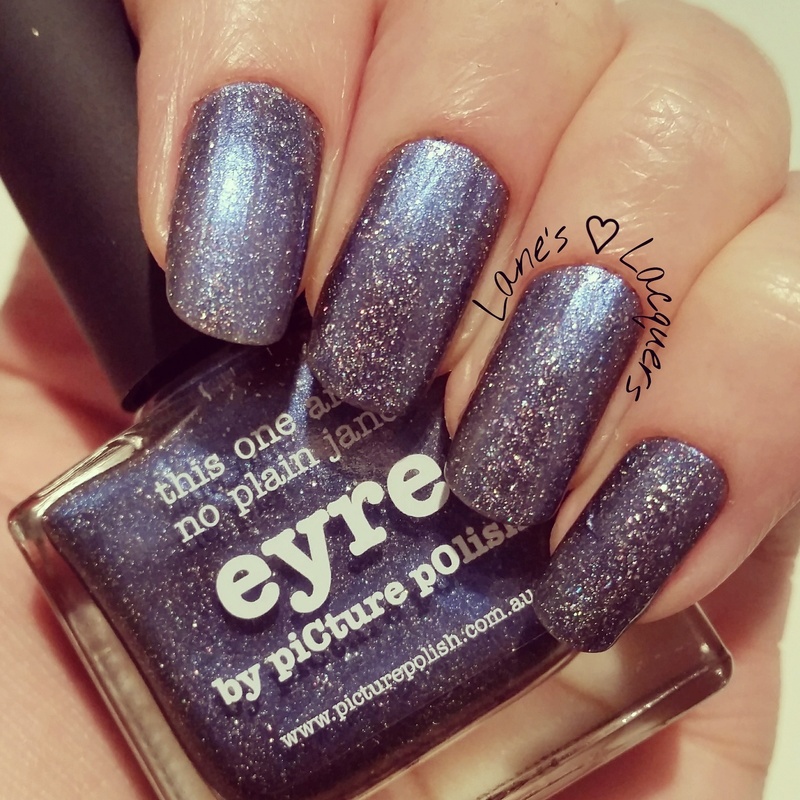 Eyre is a metallic blue scatter chrome holo and it's wonderous I love it, it's especially perfect for this time of year. 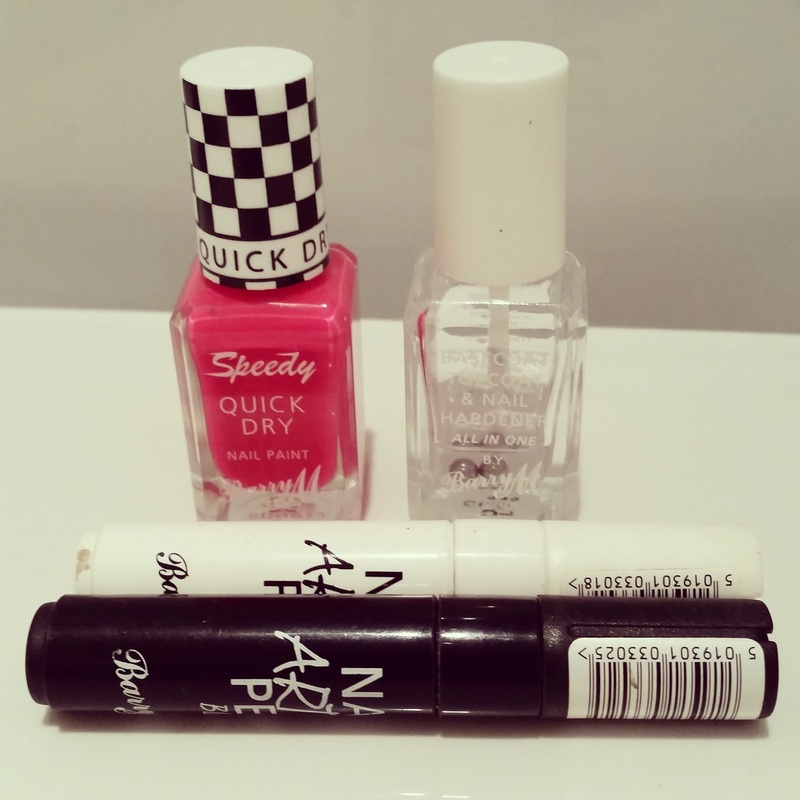 This is two thin coats with topcoat and has the fabulous formula we all expect from a PP. 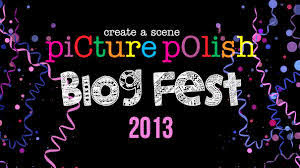 Well I'm off for a cuppa and my bed, I've got at least a few more days of resting up to go but with the majority of my body feeling anew I'll be sure to keep my blog-game up. It's Friday and I'm at home recovering from the heart op' I had on Wednesday which you can read about HERE. This means no fun or fireworks for me this weekend - Boohoo! 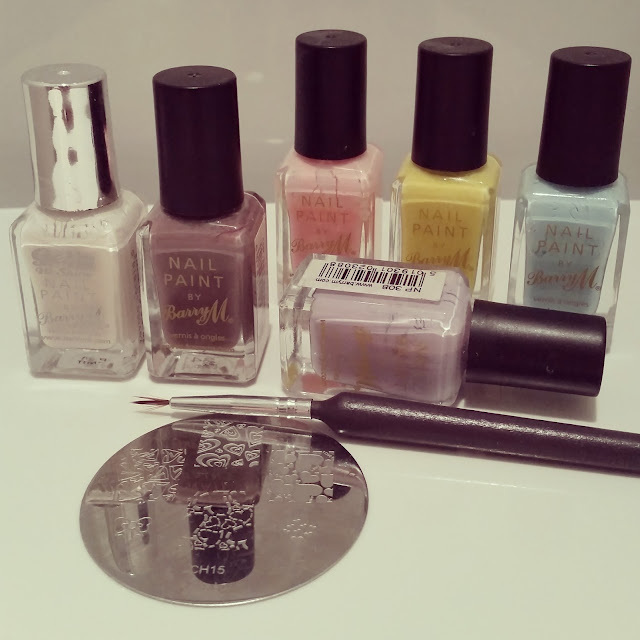 Fortunately I can still do this from my sick bed so here is this weeks installment of the '40 Great Nail Art Ideas' challenge. 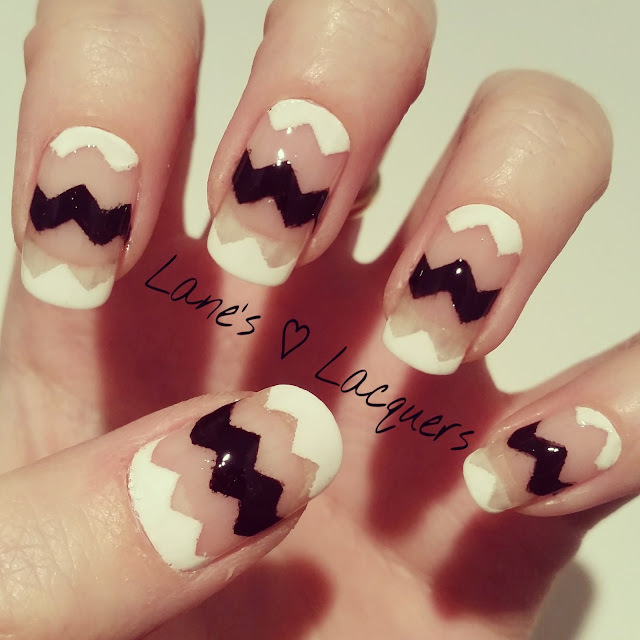 The theme this week is black & white and my personal pattern is 'Chevrons' which I paired with negative space for an eye catching result. 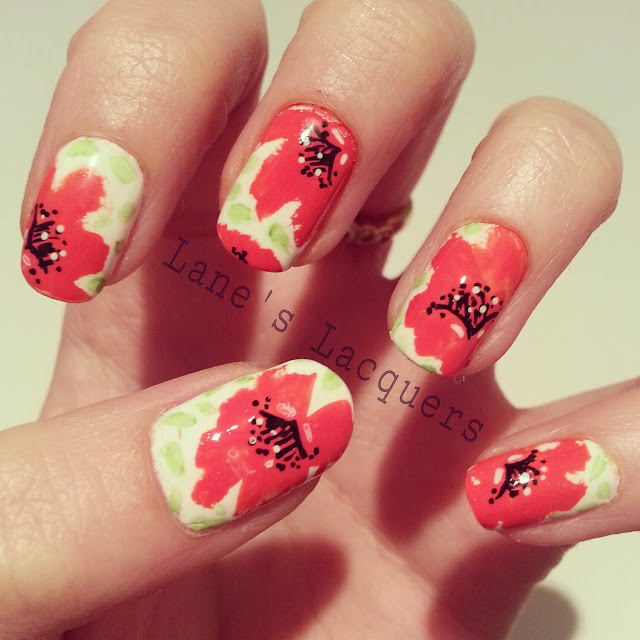 This was super simple and even quicker to do which surprised me. 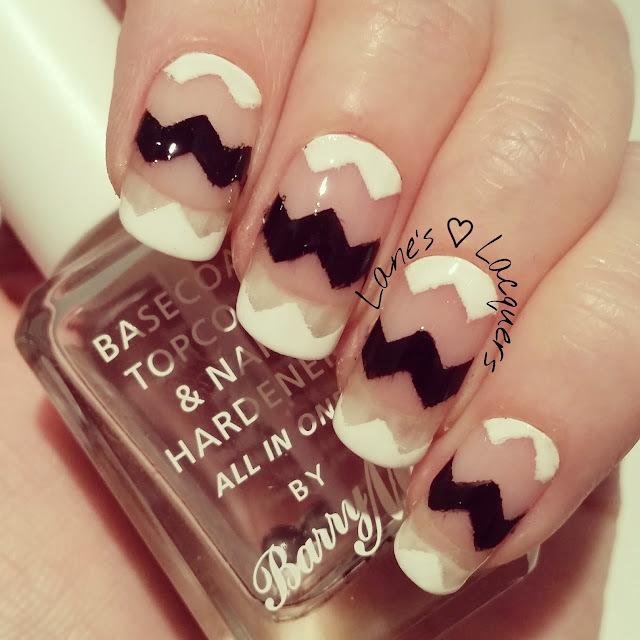 I placed two chevron (zig-zag) vinyls from She Sells Sea Shells on each nail and pressed down firmly at the edges. I added the black & white with Barry M White and Avon Licorice then finished with Bazza topcoat. I wasn't sure I'd like the bit of white free edge peeping through but actually I think it really adds to the negative space look which I just love, there's something about leaving a bit of the natural nail on show that can make a bold mani like this delicate somehow. So today it's humpday and oh what a humpday it is, the day of my heart surgery *prrrp* I have known for a while that I have a heart murmur but I've recently been diagnosed with more troubling arrythmias too. Basically my body is 'the house that Jack built' and my ticker's wiring is dodgy so it's either a bit too slow or way too fast with only short periods of 'normal' in between, but then again I've never been normal in any sense of the word lol! As a distraction yesterday I decided to paint my nails in this stitched hearts theme which I thought was rather fitting. 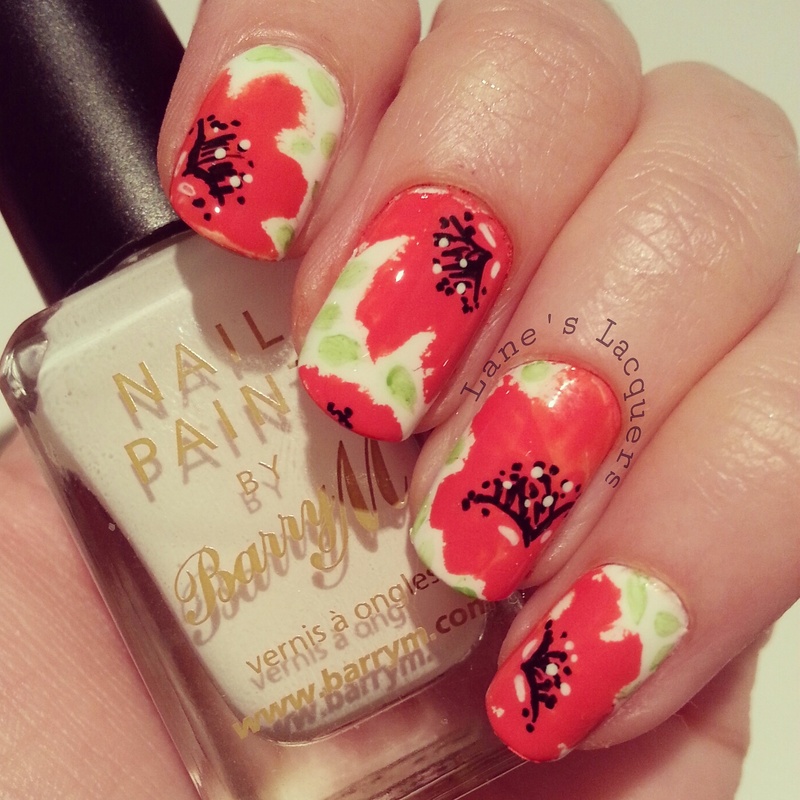 I started with two coats of Barry M Coconut and followed up by stamping with Cappucino using the Cheeky Vibrant 15 plate. 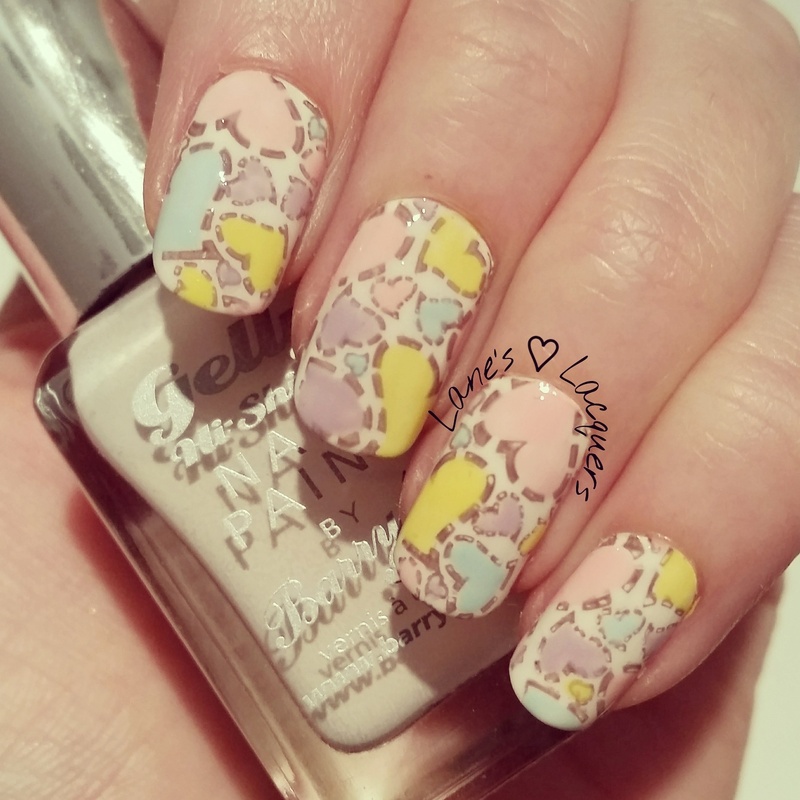 I then coloured in the hearts with a small brush using bazza's Strawberry Ice Cream, Lemon Sorbet, Berry Ice Cream & Blue Moon before finishing with topcoat. Well I'm off to the hospital for the day now so wish me luck! I've got a challenge mani planned for you guys on Friday then there'll be a swatch on Saturday after which, I'll be back! I missed you all on Saturday because there were no pumpkins left for me to carve and share with you, and I totally forgot to schedule my Picture Polish swatch so I will have that up for you this Saturday instead. Today I thought I'd share my version of the 'shattered glass' trend that's everywhere at the moment - I'll be using foil for a super quick and easy mani that was a bit of an experiment really hahaha! 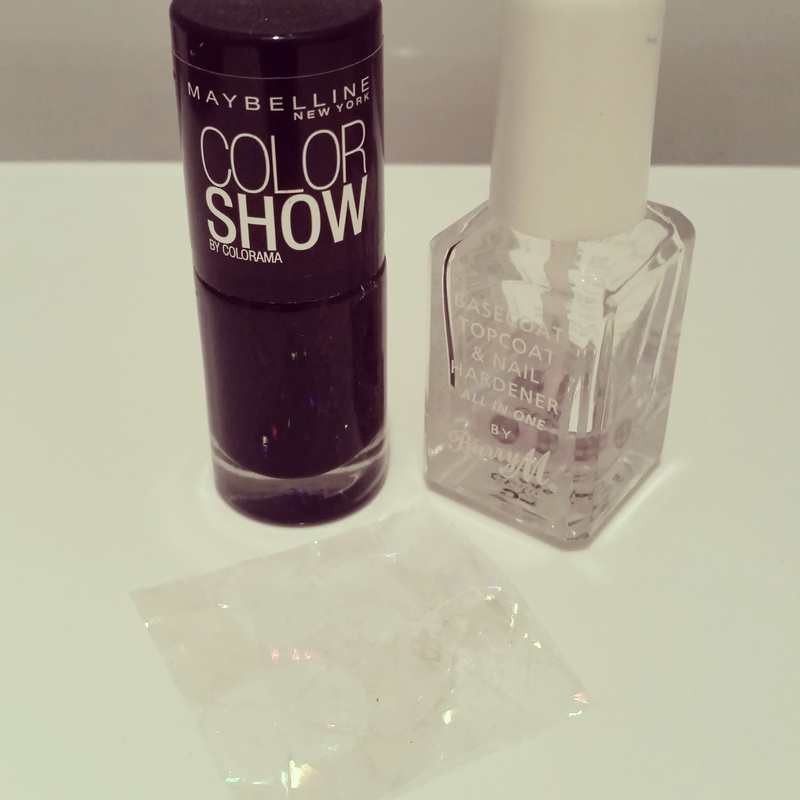 I used two coats of Maybelline Colorshow Blackout for the base, once totally dry I painted on a coat of foil transfer solution and left to dry until clear. 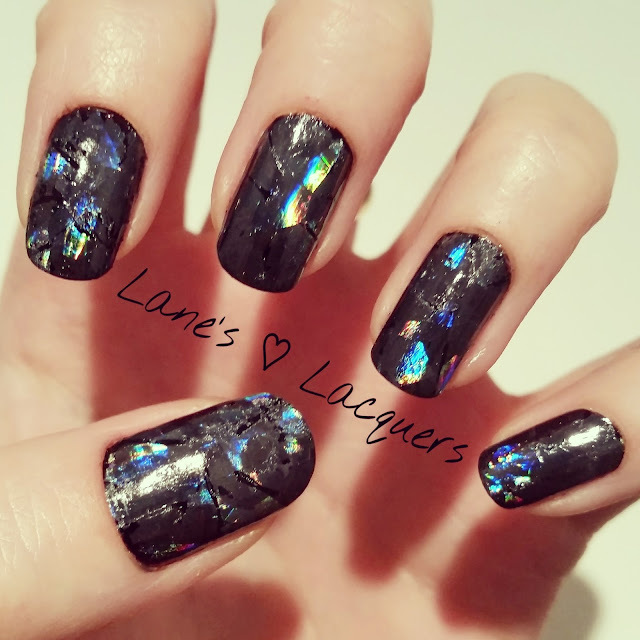 I then pressed on this sort of holographic kaleidoscope look nail art foil all over the nail and finished with a topcoat a few minutes later to avoid wrinkling. I just picked this as the best bet for the look I wanted out of a big bargain pack I got on Ebay. 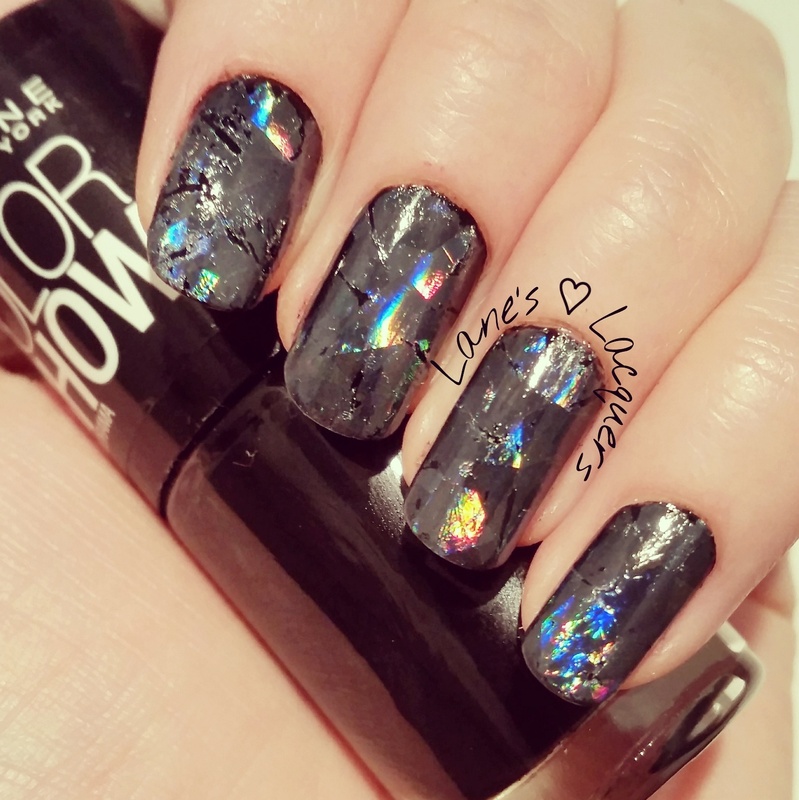 It's not exactly like what I had in my mind but I have seen this nail art show up looking so many different ways that I don't think it matters at all, and it does look like broken mirror if you ask me lol... Makes for a great winter mani whatever it is that it looks like that's for sure. I'm back on Wednesday with a hearts mani to fill you in on my dodgy ticker and the surgery I'll be undergoing that day to fix it - fingers crossed!